Alvin HEAT BLOCK is an insulation compound with unique heat absorbing properties which insulate against heat transfer during welding, soldering, brazing or other heat treatment. The heat absorption properties protect closely soldered parts, valve gasketing, thin gauge metal, and other materials which could be damaged during repair or installation work. 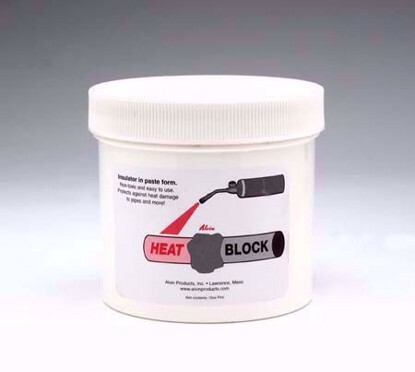 HEAT BLOCK is used to protect plastic drain pipes in close proximity to metal pipes being replaced or soldered. HEAT BLOCK prevents distortion to light gauge metals, protects rubber and plastic components, and painted or finished surfaces while soldering, brazing or welding. This non-toxic material may be formed around or on the surface of metal, or spread onto surfaces which might be damaged by heat or flame during welding or soldering. It is easily removed by wiping with wet rags or running water. Alvin HEAT BLOCK is an insulation compound with unique heat absorbing properties which insulate against heat transfer during welding, soldering, brazing or other heat treatment. The heat absorption properties protect closely soldered parts, valve gasketing, thin gauge metal, and other materials which could be damaged during repair or installation work.